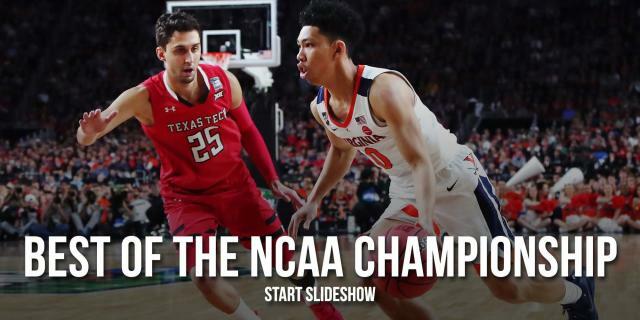 Late in the first half of Monday’s college basketball national championship game, with Virginia and Texas Tech locked in a low-scoring battle, out of nowhere, a tortilla flew onto the court. Turns out, tortillas are part of a very unofficial Texas Tech tradition. They have been for almost three decades. After kickoff at Red Raider football games, students hurl tortillas onto the field. The tradition of throwing tortillas has very humble origins. According to EverythingLubbock.com, the tradition hails from 1989, when students would take the lids off of their 44oz cokes and throw them on the field. Soon thereafter, the lids were gone, and since tortillas are a pretty popular tailgate food item, cheap, and fairly easy to hide on your person, they became the throwing item of choice. The more dramatic version of the story says that when top-10 ranked Texas A&M came to Lubbock in 1992, an ESPN announcer said that there was "nothing but Tech football and a tortilla factory in Lubbock." Therefore, in a little bit of cheeky fun, tortillas were thrown before the game. The Red Raiders went on to upset the Aggies, and we just kind of kept on doing it before games after that. Nowadays, it doesn't matter where you go, if there are Texas Tech fans, there is more than likely going to be a flour-based substance flying through the air like a UFO. In 2001, this budding unwritten practice was shut down by form of a "tortilla penalty" imposed on the Red Raiders if any tortillas made it to the field. ... The penalty was reduced from 15 yards to 5 yards in 2002, but if the Red Raider fans continued to throw tortillas on the field they would get another 15-yard penalty. Today, tortillas are still being thrown at Texas Tech football games, the rare basketball game, for graduation pictures, and for weddings. So one Texas Tech fan, presumably, decided to take the tradition to Minneapolis for the national championship game. Tortillas are fairly easy to smuggle into sporting events. They fit inside jacket pockets or down pants. After a while, stadium employees recognized the source of the tortilla stream, and attempted to stymie it. The venue’s public address announcer asked fans to stop. Ushers appears to be confiscating tortillas from the Texas Tech student section now. The flying tortilla that made it onto the court disrupted play. Virginia’s Kyle Guy picked it up and handed it to a courtside staffer. But it didn’t interrupt Virginia as it was about to score, so it was mostly harmless.